Toronto – WOOOOOOOOOOOOOOOOOOOOOOOOOOOOOOO. Just one day after I wrote about not wooing at shows, I found myself doing it excessively at the Queen Elizabeth Theater. The difference however, was everyone in the audience was also doing it. Still, kinda hypocritical. 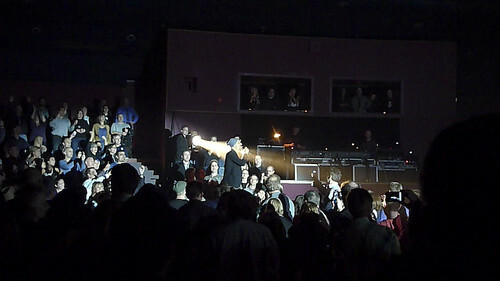 Anyways, James was in town Thursday night to play to a sold out show at Queen Elizabeth Theatre. They were here to promote their double releases this year – The Morning After and the Night Before but lets not kid ourselves here. Everyone in the crowd (most nearing 40 or over) was here for the hits. To say James delivered in spades would be an understatement. It’s such a brilliant start. I would imagine that 80% of this crowd was here for the Phoenix show a few years ago and they, like me, made a mental note about how Sit Down was not played at that show. So what happens? James starts off with that song, and walks through the crowd. Fantastic. It’s hard to describe what it feels like to be at a James show except that if you are a fan, or even a casual music fan, it would be hard to not get caught up in the tidal wave of enthusiasm that goes through the crowd and ultimately reflects back on the band. Tim Booth does his usual Tim Booth dance and is a master on stage, often engaging the crowd, leading us on, guiding us on a journey through out the night. Sure he does it every night, but you never get a sense that it’s a routine. There’s a certain amount of humility and genuine honesty that James has that makes them seem like such a personal band, despite making pretty standard (but completely awesome) pop music. The one obvious highlight for me was that they played Tomorrow, a song they decided to skip the last time around. It’s easily one of my favorite songs of all time and has been for well over a decade. So needless to say, when you hear a favorite song of yours live for the first time ever, it gets pretty freakin epic. Obviously, the middle stages of the set featured some new tracks off the double album, including Porcupine, Dust Motes and It’s Hot. I don’t think everyone in the audience was familiar with these songs and reacted accordingly, which may have frustrated Tim Booth a little. He tried his best to get the crowd dancing, but while a lot of them where, there were more who didn’t. Perhaps it was the seated arrangement. It’s always a bit odd to dance in a seated venue, but maybe that’s just me. A rapturous ovation lead to the band returning for a planned encore of Out to Get You and Sometimes, the latter resulting in a massive sing a long. A second encore did not occur. I was kind of expecting them to come back out to sing Come Home but the Queen Elizabeth Theatre people quickly turned the lights on and played background music. Maybe they wanted to go home. I dunno, I don’t think anyone else did. In conclusion, it was an epic night and this was my favorite show of the year so far. The great thing is, I get to see them twice more this year in England. 2010 has been good to me.